When you ask Simon Dale why he’s doing what he’s doing, he has a simple answer: it’s fun! He has nearly completed building his second unique, sustainable, low-impact home in Wales, designed to nourish the residents as well the natural environment. Dale has a more down to earth response to why he builds the tiny sustainable houses that have come to be known as hobbit homes. The method of reducing consumption that Dale is passionate about is building homes that respect, repair and connect with the immediate natural environment. The first natural home he built, which also happened to be the first major construction project he’d ever tackled, is tucked in the side of a quaint hill in Wales, is wood heated and solar powered, and was built in less than six months for under $5000. Dale built this house primarily by himself, though family, friends, and passersby often leant a hand. The Dale family was able to move into their cozy hillside home after just four months of construction and Dale says he spent £3000, or $4627 US dollars. He used oak thinnings from the area around the building site to build the house frame. Reclaimed wood served as a low cost and environmentally friendly flooring. All wiring and plumbing supplies plus all the windows used in the house were salvaged nearby. He experimented successfully with straw bales as insulation both in the walls and in the floor. A composting toilet, turf roof, wood burning stove keep the house sustainable and comfortable. Simon Dale, like many tiny house builders, makes a point to say that anyone can build this kind of house if they have a mind to. Just three years ago, Dale had never built a house before and had limited construction experience. He relied on a chainsaw, hammer, chisel and little else to build a cozy, sustainable Welsh home for his family. “It’s fun,” he says. If you enjoyed this post and know someone who might like it too, “Like” it on Facebook and share it with your friends using the buttons below. Thank you! You were right, Alex, I totally dig this. I’d love to build something this way. What a cool home. This has to be the best underground home I’ve seen – and I have looked at a lot of them over the years. I love the “hobbit” look of it. If you are going to go underground, why make it look like a “normal” home? – You’ve got to love the fantasy feeling. It looks like a happy home! Glad you like it Kat, I thought it was awesome too. I imagine that a home like this would help you feel very connected to this world, much like an animal. This is probably how it’s “supposed to” be. Natural wood can work too, though. But this… this is like a human nest. Must make for a very good foundation for a happy, healthy family. Makes me happy just looking at it. Happy you liked it, Jamie and Shawn. Sad that you have to head the opposite direction of civilization to build and live in something like this but great that some folks are still making it happen here and there. Very inspiring! There is plenty of moisture in Wales, where this house was built, but they have made it work. You might get it through the codes by labeling it an “earth-bermed” house. Those are currently being built within the US. And cob is similar to straw bale houses which now have codes that cover construction. It’s nice but a handful of people living on acreages is not going to put a dent in society’s dependence on fossil fuel. At worse this is just urban sprawl under the cloak of sustainability. To really reduce energy use we need to focus on energy-efficient multifamily buildings (shared walls minimize heat loss/gain) close to urban centers and mass-transit (to minimize energy used for transportation). Too true. It’s wonderful, but not an across the board fix. There isn’t enough space on earth to allow everyone to live like that. The amount of forest needed to build and sustain us like individualy wrapped slices of cheese would kill the forests of the world. Exactly, Theresa, hear hear! Although I love the house and applaud the sentiments, having a home like this is a certain kind of luxury in itself, not a contribution to the world. This is a straw man argument. Most people seem to like living cheek by jowl with their neighbors in towns and cities and are simply not cut out for rural life. They aren’t going to want their own slice of forest, anyhow. This doesn’t mean it’s not a contribution to find ways to enable those of us who enjoy a rural life and go quietly out of our minds in crowded conditions to find better ways of doing so–especially ways of doing so on less money, as finding a way of earning income vs quality of life is always a juggling act in a rural area. Theresa not enough resources for everyone to live like this? The Earth currently supports over 7 BILLION People… It tooks tens fo thousands of years to reach 1 billion in 1804 then took another 123 years to reach 2 billion in 1927 33 years to reach 3 Billion in 1960 14 years to reach 4 billion in 1974 (thats was I started to pay attention to the worlds Population) And when the world started paying attention and Population growth finally slowed…. unfortunately most of it was from FAMINE… so 13 years to reach 5 billion then another 12 years to reach 6 billion… then 11 years to reach 7 billion in 2011…. Why are humans so stupid not to see a COLLAPSE of our Population coming very soon? We reached the point where increases in fossil fuels isn’t producing enough food to feed everyone BORN since the 1970’s… Most 1st world countries population do not realise accidents aren’t the #1 killer worldwide like it is in their Country… It’s STARVATION! No. So-called “smart growth” high density housing has much to do with several health crises we are slamming into. Having everyone live in what are, frankly, slightly more self-contained dorm rooms is fine for those without kids, but it’s a setup that means that kids CANNOT spend as much time outside as they need to for their own health and development. Why? Because, unlike, decades ago, you can’t just let them play in the street. Any parent of a kid under about 10 or 12 knows that they either need to have their own fenced yard or be out with the kid every minute–or risk harm to the kid, or, if the parent deems that the kid is okay by themselves, some busybody neighbor calling CPS. The upshot of this is that NO parent has time to spend hours each day outside just watching their kids and not getting anything else done, so the kids are parked in front of the babble box indoors. High density housing is bad for children’s health. So true “modern urban” living is horrible for our children. Only one of my stepdaughters who was raised by her Grandmother out in the county has made it through “childhood into Adulthood” The other 2 who lived in Atlanta and never got to play outside and at 19 and 21 are still children and have no clue what being an Adult is about….. I disagree that we need to live in ant piles for sustainability. We need to live in ant piles for the convenience of corporations. Drop the endless consumerism and we live on land in small communities. 99% of what we buy ends up as landfill and the time we spent earning money for it… lost in space. I still play the game to pay off my mortgage but every month reduce my dependence… 50 cents at a time. This week added 3 Mahonia repens (on sale) and a half dozen Portulaca oleracea. Gave away Sumac bushes. All edible. Heritage chickens, pinyon pines, apple, asian pear, Chinese apricot, cherry, and many native edibles. Food and shelter make home. Rainwater collection… passive solar heat… no mortgage in 5 years or less. Ant hole? Best for ants. Tiny house big greenhouse food forest? A true life for me. Stacking humans in cities near bus stations? Who grows their food? Transports it? Who deals with their sewage? Trash? Who provides miles of forest to clean citified air? Who controls movement? Thought? Re-education? Mating? Where is the next Walden? Thoreau? Plato? Mister Dale talks one story, then reproduces a passel of off-spring, tragically off-setting any advantages of living simply. The time of using brute force to control interior building temperature and humidity? Long past. Billions of single species consumers at the ‘peak’ of the food chain? Non-sustainable… and was for centuries. Cities? Artificial, non-sustainable, dying as we speak. Detroit, Mexico city, Rio, much of Europe. Inviting millions of military age males to immigrate is probably the only hope of Europeans and Americans… but the consequences will be unrecognizable to anybody from 1950. Remember Newton’s Third? Expect an equal and opposite reaction. Inevitable. Intriguing and whimsical… absolutely, but at $92.00 a square foot this would not be considered cheap in my book. A simple 12 x 20 tiny house would run just over 22K at that rate. Balancing ones wants and needs, while still achieving the perfect look should be possible for half that. Check out earthbag construction, it’s possible to create a similar look and feel to this utilizing them. Most projects are reported costing as little as $10 – 15.00 per sq ft to build. Thanks, Kevin, I’ll check that out. It sure looks bigger than 50.29 square feet. I’m thinking the decimal point is off on the price per sq foot… $4627/$92 per sq ft is just 10ftx5ft and change…. Is Chris right? I had wondered the same thing when looking at the pictures. At $4600 total cost and $92 per square foot this would be a 50 sq. ft. house. It CERTAINLY looks bigger than that…should it be $9.20 per sq. ft.? Would love some clarification, as I find this home to be delightful and we have some lovely hills on our piece of utopia …(we call it Longstay…because that is our plan…to stay for a long time 🙂 ) in North West Michigan that would lend themselves quite well to this building style. Thanks and keep up the good inspirational work! My husband and I are building an earthbag home in a rural community in Michigan. It is not as cheap a some would think. Our permits, engineering fees (required by the building inspector) and the requirements of the engineer have cost us more than $15 per square foot. I do not have any regrets so far other than applying for a building permit. It will probably cost us more like $60 per square foot. The beams and concrete alone are the majority of the budget. We are hoping to make the cabinetry and windows ourselves but reclaimed wood is so expensive and are the doors and windows going to be efficient? We struggle trying to find good info about how to build a window. Are we hurting ourselves by trying to reduce our footprint? I know we will save money in the long run but up front is killing us. I wanted to be off the grid but I can’t find a system cheaper than about $20000/30000. Out house is only 1000 square feet. Why does doing the right thing for the planet have to come at such a hefty price. I often wonder if we should have gone smaller, but for us…1000 square feet is a big deal. De, I am in michigan also and am curious about the earthbag home process. I would love to hear more and to see the finished product! We live about 30 minutes south of grand rapids. We would love to show you and talk to you about our experience. We are still working on it as we had some house issues as well as weather and health issues that have held us up. Are you on Facebook? We could exchange info there if you would like. No, I avoid facebook! If you want I can give you my junk email address and I will pick it up and then we can exchange info. I am about 25 mins from detroit and would like to eventually move closer toward where you are so I am very interested in the process you have gone through. [email protected]ahoo.com Just put “earthbag” in the subject line . I am also QUITE interested. We currently live in Howell but our property is in Reed city (’bout an hour north of Grand Rapids) which is where we will be building our tiny homes. I AM on FB…Kim Tripp, please feel free to find me there. Hollie I sent you an email and Kim I will look you up. I’m from Michigan, now living in Oregon. Am considering returning there as property is far less expensive and I’d like to build a small home (thinking 5-600 sq feet is plenty). Was wondering if you went with 1,000 sq ft because of zoning and how difficult a time you’ve had with an earth bag home with the township or other agencies that typically seem to frown on these kinds of homes. Are they making you connect to the electric grid? Will you have your own well and septic or can you do a composting toilet or outhouse? How difficult and time consuming has it been to work with the people in charge to see this project approved? Appreciate any info you can provide. And I can also be found on Facebook. Am the Karla Lindquist from Salem, OR with Morticia Adams for an avatar. I sent you a fb message as some things I don’t want to say out loud as I do have to deal with inspectors but I wanted to give you all the help I could. If you decide to make a trip to Michigan I would love for you to stop by and see what we have done. We have had pretty good luck with our township since they made us hire an engineer. The plans we bought were signed but not by a Michigan engineer. I do know of a lady completely off the grid..but I also know a couple people who have alternative power sources and put energy out yo the grid and collect a monthly paycheck. I am unsure about septic but know we have people who live in campers on their property all Sumner without septic. Where I live public sewer is not a possibility so I would think there may be ways around it as long as you also had a way to use your grey water. Again we have had pretty good luck with our inspectors. We gave them the plans we have and they know that earthbags are not an exact science. Overall it has been a great experience. I feel for you. Doing what is right for the planet often means becoming green and independent which means someone is not making money off of you. It all boils down to profits, so they try to get their profits up front with all the expensive requirements, which are also designed to discourage other like minded people who will also become independent and lose them money. Unfortunately, there is not a lot one can do about it, but don’t be discouraged! You are almost free! We will move to another energy source as soon as it gets too expensive to use what we are currently using. It is human nature to go with what costs us the least. Once fossil fuels are completely depleted we will move on to something else. Sorry if this offends but it is the truth and everyone can rail against it all they like it makes it no less true. In the mean time getting back to the land is a desirable and laudable goal regardless of whether you think climate change is a result of cosmic rays or man made causes. I believe all of us are way too removed from our food sources as evidenced by the fact that people are willing to buy the low quality of food that they sell in the grocery store. Again going toward what is cheapest. Making choices that are better for the body and the environment is the best way to live at any rate. Organic just taste better and is more nutritious for the body. Truly free range eggs have mere nutrients and taste better, grass fed beef is more nutritious, and organically grown may not look as pretty but it definitely better for you. The tiny house will catch on because it is an alternative way that is cheaper and allows you to get closer to the earth and live more organically. 2011 we surpassed 7 BILLION people… The Earth cannot sustain that population without fossil fuels. It fueled the boom in population 1 Billion souls in 1804 6 billion more in 109 years…. All because of fuel based Agriculture… first commercial steam engine was invented in 1781…. And Populations exploded due to “cheap” energy to grow and transport crops…. Wow, to live in such a place of beauty! I would love to look out my front door and see that horizon. I love this concept and have dreamed of it for many years, but it’s not do-able without relocating, which is not an option for me. I’ll keep dreaming. Glad you liked it, Theresa. Are bugs and water a problem? How about mice? We have mice here in this rural area. great house i cant think of a nicer home to live in. how hard is it to get planning for such a home ? Just saw this one for the first time. I love it! What a beautiful house. Thanks for posting it, Alex. Although the house is interesting and looks comfortable I don’t think most municipalities would allow this type of dwelling. Getting a permit would probably be out of the question, which means the owner could be forced by the authorities to destroy their home. The price per square foot is high and is comparable in price to building using standard construction. Perhaps building codes are not as stringent where this family lives. “Frank should live in an ant hill, that would would really reduce the carbon footprint.” This place is fantastic, I really don’t know how you managed to build such a complex assortment of angles and still manage such a comforting flow to your home, your kids are beautiful! Tom. Lovely family, lovely home. This house is like everybody’s dream cottage in the woods. I am totally envious! But on the other hand, I am glad somebody gets to live the “dream”, and I don’t mean the American dream. Best wishes! Beautiful home and beautiful family! Cozy and cute! I would love to hang out there. De, could you please message me on facebook as well? My wife and I are planning to build near Grand Rapids next year and would like to do strawbale or earthbag as well. I’d love to hear more about recommendations with the permit process and any other advice you may have! Thank you for posting! Fortunately, there is a simply way of repairing a water damage ceiling. First of all, the owner should evaluate the current condition of the house. that can build up and block drainage. What an ingenious couple! The children look like lovely little wood sprites. The house is remarkable; and easily blends into its surroundings. It truly is a Hobbit House. I think this was recently on the Exploring Alternatives YouTube channel. He’s a regular little Bilbo Baggins, Isn’t he…! Great little Hobbit Tiny House…! And the children will have a true to the living experience of living the Hobbit life, where other children could only read in books, or see in a movie…. 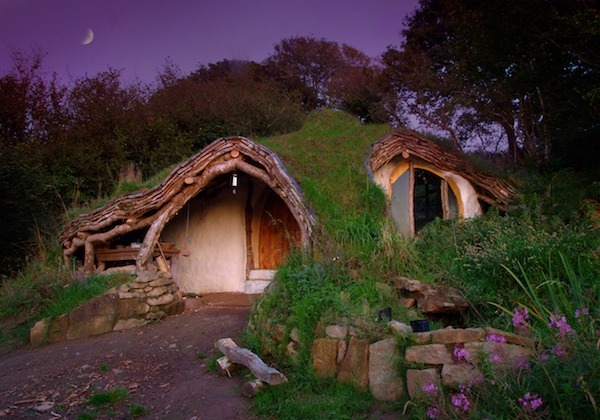 Now that is some thing.. How many of you could say I grew up in a Hobbit House or lived like a Hobbit….? I hope someday my kids 🙂 My husband and I have tiny hobbit house dreams! We shall see. I’ll keep my fingers crossed for you…! But I believe that if you want it bad enough you will make your own dreams come true.. Besides your a good enough person I’m sure your husband see’s that and will make you anything you want for you and your children…..! Beautiful vision, no doubt. I love the idea of it. There’s no place like home. I live in earthquake country with building codes so this method of construction would be forbidden because it would be very dangerous. The design itself however could be possible with much stronger construction. In other parts of the world it might work out. Since posts here initially are from 2014 I’d like to know if they still live there, and did anyone else here build one?